The space shuttle Endeavour is seen docked at the International Space Station in this view taken by an exterior camera on Feb. 10, 2010. At top, the station's new Tranquility module and dome-shaped Cupola window addition can be seen in the shuttle's payload bay. Astronauts aboard the International Space Station tackleda tricky repair of their urine recycling system Wednesday while engineers onEarth study two issues on the space shuttle Endeavour. Station commander Jeffrey Williams is expected to spendhours today replacing a broken urine recycler part and pump inside the orbitinglab?s water recovery system while other astronauts unload cargo and prepare fora Thursday night spacewalk. The spare parts for the repair were delivered by NASA?sspace shuttle Endeavour, which dockedat the station early Wednesday carrying six astronauts and a new room andobservation deck for the orbiting lab. Meanwhile, engineers at NASA?s Mission Control center inHouston are studying two minor concerns on the shuttle Endeavour. Photos of the spacecraft taken before it arrived at thespace station revealed a ceramic spacer jutting out near one of Endeavour?scockpit windows. Also, a once-repaired crack in a white heat-resistant tile ontop of the shuttle?s cockpit has reappeared. Deputy shuttle program manager LeRoy Cain said neither issueis expected to pose a serious concernfor Endeavour or its crew. But engineers are checking them out just to besure, he added. A repair of either item is not expected to be required,but they would be within reach of spacewalkers should one be needed, Cain said. Mission Control also radioed Endeavour?s crew to say theshuttle?s heat shield looks to be in good shape. 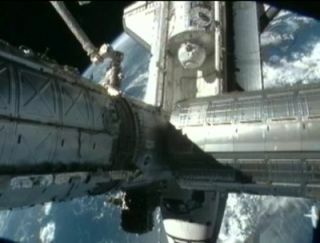 No extra inspections will be requiredduring the eight days Endeavour is linked to the station, mission managerssaid. NASA has kept a close watch over shuttle heat shieldhealth since the 2003 Columbia disaster. Mission managers hope Williams will be able to reactivatethe urinerecycler so it can be tested later in the mission. The urine recycler andlarger water recovery system are due to be moved into the new station roombeing delivered by Endeavour?s crew. ?We think we?ll be able to take as much time as we needto try to restore functionality of the system,? said shuttle flight directorKwatsi Alibaruho today. Astronauts began drinkingrecycled urine, sweat and condensation last year using a $250 million waterrecovery system designed to support full six-person space station crews and cutdown on the amount of water shipped to the orbiting laboratory. The keg-sized urine recycler component, called a distillationassembly, includes a spinning centrifuge that helps filter astronaut urine backinto pure drinking water through a seven-step process. It has been replacedtwice since the first one launched in late 2008 (most recently last November). ?The concept is very simple,? explained Don Holder, chiefengineer at NASA?s Marshall Space Flight Center in Huntsville, Ala., who helpeddevise the repair plan. ?Basically, you are boiling urine. The problem is that,in effect, you don?t have gravity anymore. So you need this centrifuge to helpseparate the urine.? Holder told SPACE.com that a buildup of calcium from theastronauts? urine likely clogged an overflow hose in the centrifuge, leading toslight flooding. They refurbished an older distillation assembly fromstorage and sent it aboard Endeavour for delivery, along with a new pump.Engineers hope to fully reactivate the urine recycler, as well as the largerwater system and a related oxygen generator. William and his station crew have up to 11 containers ofstored urine aboard to run through the recycler to make sure it?s working. Endeavour?s six-astronaut crew is flying a 13-daymission to deliver a 23-foot long module named Tranquility in honor of theApollo 11 moon landing. The shuttle also delivered a seven-window observationdome that will be attached to the new module during the mission. Both additions were built by the European Space Agencyand together cost about $409 million. While Williams repairs the urine recycling system,Endeavour?s astronaut crew will move cargo from the shuttle into the spacestation. The astronauts will also resize a spare spacesuit to fitcrewmate Robert Behnken, Endeavour?s lead spacewalker. Behnken?s spacesuitsuffered a glitch that has failed to power its onboard heaters and lights. NASA ordered the crew to resize a spare suit on thestation for the mission?s three spacewalks to install a new room andobservation deck at the space station. The spacesuit swap is not expected to affect Behnken?scomfort or work during the upcoming spacewalks. The first spacewalk is set for Thursday night and expectedto be particularly challenging. Mission Control gave the astronauts a half-dayoff later tonight to rest up. The crew is flying on an overnight schedule inwhich they work at night and sleep in the day. Video - Recycled Space Urine: Would You Drink It?